Just curious, Jeff. Is that a Flash Gordon panel, perchance? It does look like it, but no, it’s from “Exciting Comics”. I can’t recall the name of the guy or the specific strip but although it has a very “Flash Gordon” vibe, it’s not. 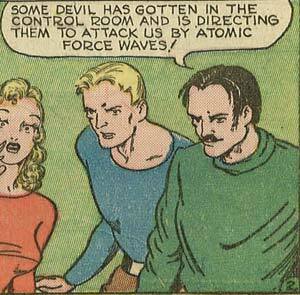 I don’t know what an atomic force wave is, but it sure don’t sound good….